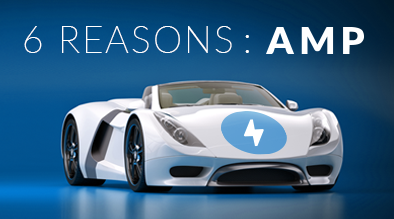 For speed, Accelerated Mobile Pages are hard to beat, but it’s more than speed… here are 6 reasons why. Mobile devices are omnipresent in our lives; home, work, or on the go, mobile devices are now our personal assistant and best friend. It’s well established that if it takes more than 3 seconds for a site to load your users will abandon it. Users quickly lose patience and look for an alternative. Google wanted to create a better way to deliver web pages faster to users. This realization was the start of Google’s Accelerated Mobile Pages (AMP) project; an open-source project designed to reduce the time it takes for a web pages to download on a mobile device. It helps companies create content that instantly and improve experience of the mobile web. According to Mary Meeker’s Internet Trends Report, the typical consumer spends more than 3 hours per day on their mobile device. Searches from mobile devices that include the word “best” have grown by 80% in the past two years. For most verticals, mobile share has surpassed 50%. With mobile replacing the desktop as the primary search platform, search engines worry that slower connections will create poor user experiences. Google is already favoring Mobile first indexing which means that sites with outstanding mobile experiences are likely to be ranked higher than those that provide a poor mobile experience. Page speed and performance is an undoubted strength of Accelerated Mobile Pages. AMP pages render 15% to 85% faster than standard HTML counterparts, leading to a rich consumer experience and better engagement and conversion. Studies have shown that a one second delay in page response results in 7% less conversions. Google mentioned in a search engine land article that the median load time for accelerated mobile pages (AMP) is 0.7 seconds (the time it takes for your eye to blink twice) vs 22.0 seconds for a non-AMP page. End users are no longer willing to wait longer and hence if the content is not served quickly they leave the site to never come back. AMP helps to deliver content faster and, in the process, secures top of the funnel traffic – we also know that 80% of queries are informational in nature; people who are just “browsing” and looking during the awareness stage. AMP pages allow us to reach these people quicker and catch them early. AMP will also become increasingly more popular because of mobile first indexing with Google giving the AMP label to search results coming from AMP pages. Milestone has been a pioneer and an early adopter in deploying AMP sites and its case study on a San Francisco Bay Area Hotel – Millwood Inn has been featured on the official AMP site. Once Milestone launched Millwood Inn’s new mobile site, the results were astonishing. Mobile transactions jumped more than 83%, Conversion rates leaped more than 68% and total booked revenue on mobile increased more than 52%. Additionally, compared to the non-AMP pages, the AMP pages yielded a 61% better clickthrough rate (CTR) and those users drove 83% higher rates of transactions. By choosing a CMS that supports AMP Pages such as the Milestone’s CMS platform ; an SMB can deliver rich AMP experience to its target customers. AMP pages have the added advantage of being able to leverage Google caches, something otherwise unaffordable by most of these smaller organizations. You can tag your AMP pages content with schemas so that search engines understand the goal of your website and content, making it more likely that you will be found for relevant queries. Whether it’s your business name, type, or address, Milestone can populate your content with the right schema to get you found on any device, and any channel. In voice assisted devices, more than 60% of results come from featured snippets. Featured snippets come from question-based searches and answers with long tail keywords bring the best results. Google recently confirmed a new form of search result snippet which are in the form of FAQ’s. The “How To” mark up, “FAQ” mark up and “QA page (Question Answer)” markup can be leveraged for Position 0. These new Schema types with enabled content can easily tap into voice queries coming from Alexa, Siri or Google. For maximum compatibility with the voice-powered world, structured data enables your content to surface in experiences like AMP pages, voice answers, maps, and Google knowledge graphs ( https://schema.org/HowTo, https://schema.org/QAPage, https://pending.schema.org/FAQPage). If you are interested to try out the AMP page experience for your mobile device please feel free to send us an email at [email protected] or call us at +1 408 200 2211.